A 28-year old man was found “down” in front of his house. There was a history of alcohol consumption. The patient was not lucid enough to answer questions. His initial ECG is shown in Figure-1. What key piece of information is missing from the history? Figure-1: Initial 12-lead ECG and long lead II rhythm strip obtained from a 28-year old man who was found “down” in front of his house. NOTE — Enlarge by clicking on the Figure. Rhythm & Rhythm — The rhythm is regular at ~55/minute. The QRS complex is narrow. Regular P waves are present — although they are of very low amplitude. Rather than being best seen in lead II (as is usually the case with sinus rhythm) — P waves are probably best seen in lead I. Thus, the rhythm might be either sinus or low atrial. Intervals — The PR interval is upper normal (ie, ~0.20 second). As noted, the QRS is of normal duration (ie, not more 0.10 second = half a large box). However, the QT interval appears prolonged. Determination of the QTc (corrected QT interval) is always challenging when the rate is slow. It is probably easiest to assess the QT interval in the long lead II — because we have 9 consecutive beats to look at. Discounting those with significant artifact — we measure the QT = 0.52 second in this lead. Considering the reduced heart rate of ~55/minute — this corrects to a QTc ~ 480-500 msec, which is long. Axis — Normal (about +60 degrees). Figure-2: We have added RED arrows to Figure-1, to highlight the clue seen just before the takeoff of the ST segment (See text). Answer: The positive, notched deflections that are seen just after the QRS complex and just before the beginning of the ST segment in Figure-2 are Osborn Waves (RED arrows). 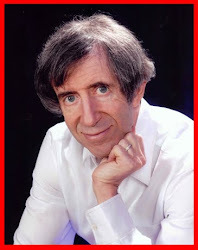 Osborn waves were first described in 1953 by JJ Osborn. The wave is commonly linked to hypothermia — but other entities (including CNS injury and ventricular fibrillation) may also be associated with it. 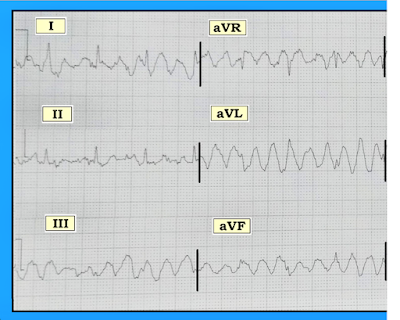 A number of other names have been attributed to this ECG finding (“camel-hump” sign; hypothermic wave; prominent J wave). Osborn waves are often not seen until the temperature drops below -32 degrees Centigrade ( = 89.6 degrees Fahrenheit). 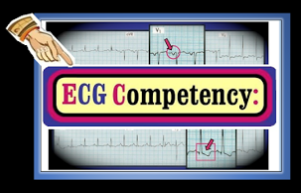 Other commonly associated ECG features with Hypothermia include: i) Bradycardia (which may be marked); ii) Atrial fibrillation or other arrhythmias; and iii) Artifact (from baseline undulations resulting from associated shivering). What KEY Information was Missing from the History? No mention was made of the patient’s initial core temperature. Unfortunately, the initial temperature was not attainable — but ambient weather conditions were freezing, and the patient was “cold”. J waves (Osborn waves) in this case were dramatic — both in amplitude, and by their presence in virtually all leads. Other findings consistent with hypothermia in this case include: i) marked artifact with baseline undulations; ii) bradycardia; and iii) low amplitude atrial activity that may make it difficult to be certain of sinus origin. The patient was intensively treated for hypothermia. He recovered. 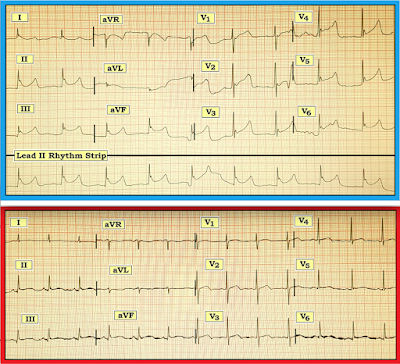 Figure-3 compares his initial ECG (top; light blue border) — with his follow-up ECG after core temperature was corrected with associated improved mental status (bottom; red border). What are the differences between the pre-treatment and post-treatment tracings? 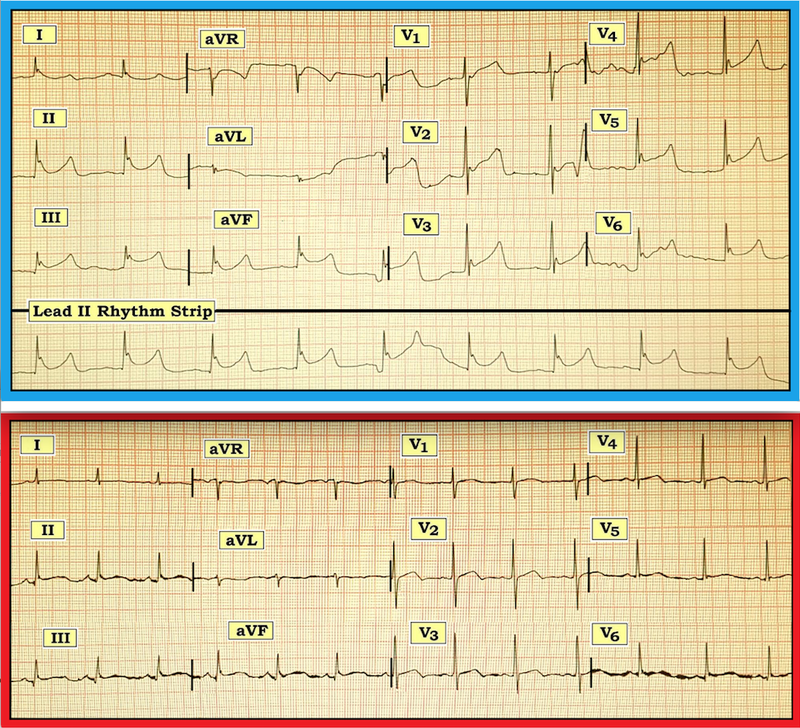 Figure-3: Comparison between the pre-treatment ECG (top; light blue border) — and post-treatment ECG (bottom; red border). What changes do you see? Answer: We note the following changes between these 2 tracings: i) the heart rate is faster after core temperature has been corrected; ii) Osborn waves are no longer seen; and iii) the diffuse ST elevation has resolved. Baseline artifact does remain. 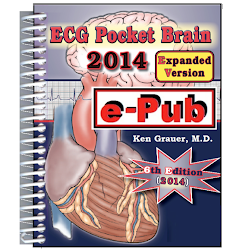 This patient had neither acute infarction nor acute pericarditis. Management of severe hypothermia is complex and comprehensive. Core rewarming is key. Many conditions predispose to hypothermia — including ambient cold weather exposure and alcohol consumption, as was seen in this case. Impaired mental status makes it imperative to rule out CNS injury, undetected infection or other metabolic disorders that may be contributing to his condition. Acknowledgment: My thanks to 유영준 from Seoul, Korea for his permission allowing me to use this tracing and clinical case. 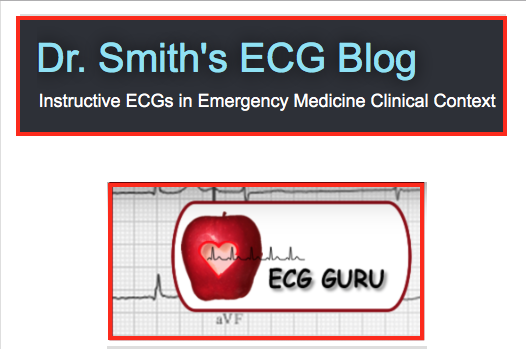 Is the patient whose 6 limb leads are shown in Figure-1 in VFib (Ventricular Fibrillation)? 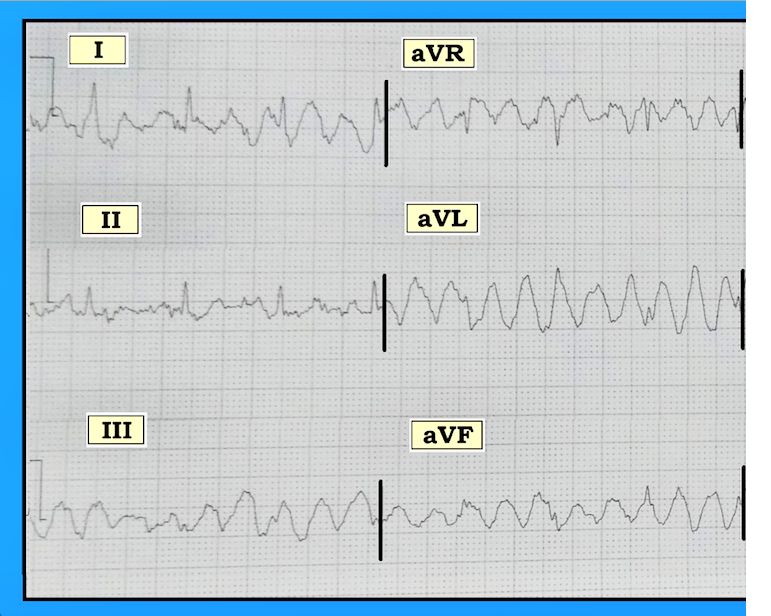 Can you tell from these 6 leads, even before you see the rest of his 12-lead ECG? Figure-1: Is this patient in VFib? NOTE — Enlarge by clicking on the Figure. 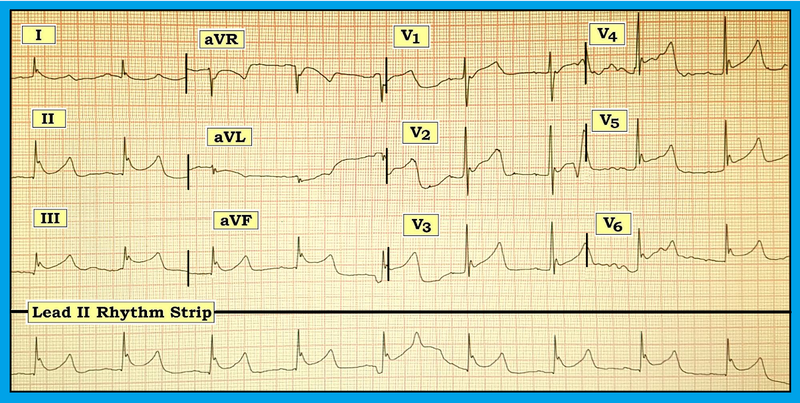 If one simply looked at these 6 leads — it would be easy to think this patient had just gone into VFib. However, there is enough information on this limited tracing to tell that this is not the case. The presence of artifact is extremely common. Potential sources of artifact include tremor, shivering, brief seizure activity or other body movement; loose or faulty lead connection; external devices that may produce various types of interference; and application of a monitoring lead in close contact with a pulsating artery, among others. Extreme clinical conditions with acutely ill patients may at times lead to unavoidable artifact. 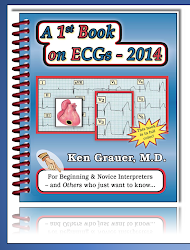 That said, most of the time interpretation of the ECG will still be possible despite a less-than-perfect recording. However, when artifact becomes as pronounced as it is in leads III, aVL and aVF of Figure-1 — interpretation of the ECG may become extremely challenging. The best way to prove artifact — is to recognize persistence of an underlying spontaneous rhythm that is unaffected by any erratic or suspicious deflections that are seen. Therefore, despite close resemblance to VFib in leads III, aVL and aVF of this ECG — an underlying regular supraventricular (that is, narrow QRS) rhythm at a rate just under 100/minute can still be seen in other leads. Figure-2 shows the remaining 6 leads for this 12-lead tracing. Do the 6 chest leads that are now seen support your answer? Figure-2: Complete 12-lead ECG for the patient whose 6 limb leads were shown in Figure-1. Answer: The baseline “noise” and artifact deflections continue in the chest leads. However, it is now much easier to appreciate that a regular underlying supraventricular rhythm continues throughout the entire tracing. Proof that the high-amplitude chaotic deflections seen in leads III, aVL and aVF constitute artifact is forthcoming from inspection of simultaneously-obtained leads (Figure-3). Figure-3: We have dropped vertical lines (in red) from definite QRS complexes seen in leads I, II and aVR (See text). 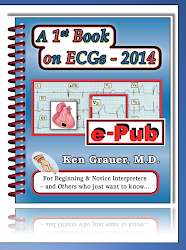 NOTE: The baseline ECG is a photograph, and was unfortunately somewhat tilted. 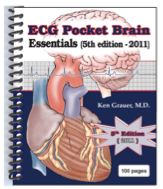 This is why the red lines may appear with slight angulation — but they are parallel with the ECG grid lines, and therefore do correspond to simultaneously-recorded QRS complexes. PEARL: Awareness that almost all modern ECG machines produce simultaneous recordings of at least 3 leads at a time may prove invaluable in arrhythmia interpretation. It allows accurate determination of QRS duration. 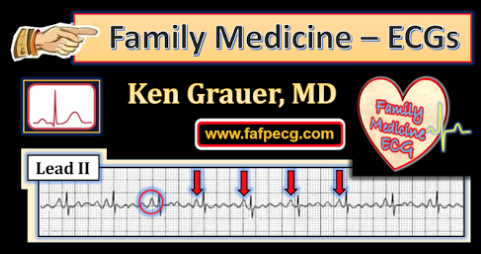 This is especially important when part of the QRS complex lies on the baseline and appears narrow in some leads, when in fact other leads clearly demonstrate QRS prolongation. It tells us if atrial activity is arising from a single site or multiple atrial sites (ie, P waves from different atrial sites may look similar in some but not all leads). It facilitates detection of artifact — which often appears much more marked in some (but not all) leads. Analysis of Figure-3 should remove any doubt that the chaotic deflections seen in Figure-2 are the result of artifact. Vertical RED lines should make it evident that you can clearly “walk out” a regular supraventricular rhythm at a rate just under 100/minute in virtually all leads on this tracing. 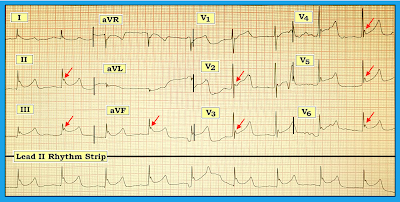 Note that while we suspect the mechanism of the underlying narrow rhythm in this ECG is sinus (upright P waves are suggested in lead II ) — the amount of artifact prevents clear distinction between a sinus vs junctional rhythm. But we can say with certainty that a regular supraventricular rhythm is present. 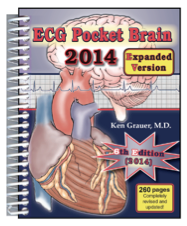 Acknowledgment: — My thanks to MG for his permission allowing me to use this tracing and clinical case.